Triphora [Trip.] trianthophora Photo from © Royal Botanical Gardens, Dr. Donald Gunn Image Collection. Previously undocumented population spotted by volunteers. A previously undocumented population of three birds orchid (also known as nodding pogonia) Triphora [Trip.] trianthophora was discovered by volunteers at an MNA sanctuary in the southwestern Lower Peninsula this summer. "offers a great challenge to the orchid hunter. Not only are stations for this orchid rare and confined to the southern parts of our region, but its habit of producing in some seasons a handful of plants - even though in other seasons it may carpet the woods - makes it difficult to detect in most years." 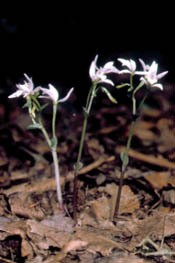 The three birds orchid gets its name from the resemblance of its small pink and white flowers to three birds in flight. It is listed as a threatened species by the State of Michigan.